Makes items that normally are invisible in First Person Combat appear as they should. 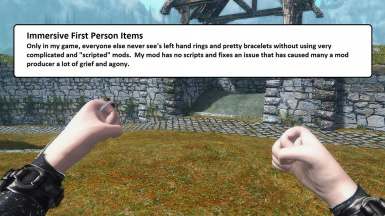 Fixes all rings mods, bracelets of all kinds, and many other unique mod items ALL of that without scripts. There is no other mod that corrects this issue in as simplistic a manner as this one does and at no performance cost. 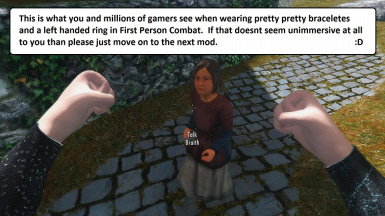 Immersive First Person Combat "Items Fix"
A fix of crucial importance to immersion. "thanks for the immersivability of this immersive mod that u hv immersively created for us who thirst for immersion. 100% compatable with first person mods. I made it compatible with PlayerVampire in mind. This mod 100% deserves the use of "Immersive" it does its job so well that I totally forgot that I had made this thing, I've had this for over a year maybe two in my game. If I have to show you an image for every possible item fixed by this mod then this file would have to be rated Adult Content rather than E for Everyone. Also, it does even more! -Prevents Piercings from slipping out of sight! -Prevents quite a lot of Super Bowl Sized wardrobe Malfunctions! -Does not contain, more stuff! Get this fix without extra stuff like rings you don't want or fixes you didn't want! -Play the game knowing your Custom Outfits don't epically fail in First Person today with a Gamefever 1st Person Combat Fix Today! For Mod Nerds who know this stuff like me. So it uh activates items from quite a few mods and a few that some might not know about even. Want to see more mods by me?